Though the labels are blank , I am pretty sure that this is the OVATIONS - first track is THE DAY WE FELL IN LOVE aka OH WHAT A DAY and is different from the released versions . the flipside is a song i am unfamiliar with and is quite possibly unreleased . i couldn't any info on it . LISTEN to BOTH TRACKS in the above player , one follows the other . i have cut out some of each of the song to discourage mp3 distribution . a bit from the middle of first track , and the end of the second . 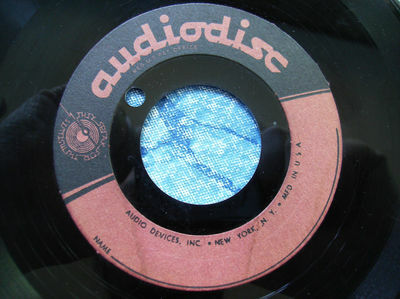 this was done on purpose , the actual acetate itself plays the entire songs . PAYMENTS MUST BE RECEIVED WITHIN 7 DAYS. if you need more time you will need to contact me first . RECORDS ARE SHIPPED MEDIA MAIL IN THE US , it can take some time to get to you . if you would like priority shipping , please ask and wait for me to send you another invoice. APPROXIMATE COSTS FOR ADDITIONAL LP'S ARE LISTED BELOW , however these prices are just a close guess ( because of the varying weight of each lp , AFTER the auctions end , i will send an invoice based on the total weight of the package. please remember to count double lp's as two . UNITED STATES - for MEDIA MAIL first additional is no extra cost usually , add about 50 cents for every 2 lps thereafter . CANADA add about $ 3.50 for each additional lp . REST OF WORLD add about $ 4.50 each additional lp. international rates above applies to up to about 5 lp's after that prices may a much higher. again count double lps as two . ALSO , IF YOU WIN MULTIPLE ITEMS , WAIT FOR ME TO SEND YOU AN INVOICE WITH ALL ITEMS ON ONE INVOICE. thanks ! ALSO, A PARTICULAR COUNTRY'S CUSTOMS AGENCY WILL SOMETIMES HOLD PACKAGES (FOR INSPECTION I ASSUME) FOR UP TO NINE WEEKS YES 9 ! . SO, IF YOU DON'T GET YOUR PACKAGE WITHIN A FEW WEEKS ,THIS MAY HAVE HAPPENED, DON'T FREAK-OUT, CONTACT ME, AND CONTACT YOUR LOCAL CUSTOMS AGENCY. PLEASE EMAIL WITH ANY QUESTIONS OR PROBLEMS BEFORE LEAVING FEEDBACK. Doo Wop/R&B: TRI-GERIANS Kingdom of Love 45 on MARLO mp3 LISTEN! ORIG. '60 ALA. Rockabilly/DooWop DINKY HARRIS/SPADES She Left Me Crying/Jeannie HEAR!